The Board of Commissioners of the Public Procurement and Concessions Commission (PPCC) has appointed Attorney Jargbe Roseline Nagbe Kowo, as Executive Director of the Commission. The appointment of Atty. Kowo followed a competitive and transparent recruitment process led by the Civil Service Agency, and witnessed by partner institutions. She will head the Secretariat and manage the day-to-day affairs of the Commission, and ensure implementation of the Public Procurement and Concessions Act of 2010, along with all accompanying regulations on public procurement. Atty. Kowo brings to the Commission the right mix of education, skills and experience and possesses an impeccable character essential for an integrity institution like the PPCC. The new Executive Director will be inducted into office on Friday, April 5, 2019 at 11 am, in the conference room of the Commission. Atty. Kowo earned a Bachelor of Laws(LLB) degree in 2011 from the Louis Arthur Grimes School of Law of the University of Liberia and Bachelor of Science(BSc) degree in Economics from the same University. 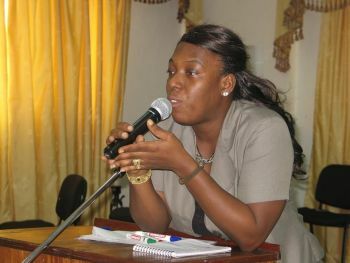 She also received a chartered diploma in Strategic Public Procurement from the UK based Chartered Institute of Purchasing and Supply(CIPS), and has membership with several professional organizations including Liberia National Bar Association, Center for Civic Education, Association of Women Rights in Development, Building Resources in Democracy, Governance and Elections(BRIDGE), and Chartered Institute of Purchasing and Supply(CIPS). Until her appointment to this position, the new PPCC head of Secretariat worked with the National Elections Commission (NEC), where she served in several capacities including Director of Procurement, Gender Director, and Acting Director for Civic and Voter Education. She is credited for efficiently and effectively managing procurement activities that led to the successful conduct of the 2017 Presidential and Representative Elections in Liberia. The Board of Commissioners of the Public Procurement and Concessions Commission therefore reconfirms and reaffirms its commitment to an effective implementation of the PPCA 2010; and is confident that Atty. Kowo has the competence and experience to perform the task to be entrusted to her care.